Fans of giant monster movies are going to get their dream rematch in the next few years. The upcoming King Kong movie is switching studios so that, eventually, King Kong can fight Godzilla in a massive, big screen showdown. Deadline reports Legendary Pictures is moving Kong: Skull Island from Universal Pictures to Warner Bros. Pictures. Because Warner Bros. is where Godzilla lives and, eventually, the two will cross over and do battle. The plan is for Kong to come out in March 10, 2017, then Gareth Edwards’ previously announced Godzilla sequel will be released on June 8, 2018. Then, a third film would happen, pitting the giant lizard vs. the giant ape. Directed by Jordan Vogt-Roberts, Kong: Skull Island will star Tom Hiddleston and Brie Larson. It’s a prequel story explaining the origins of Kong. Godzilla 2 is the follow up to the 2014 hit, and will feature the current King of the Monsters battling some of his most iconic foes, Rodan, Mothra and Ghidorah. No word on casting for that one. 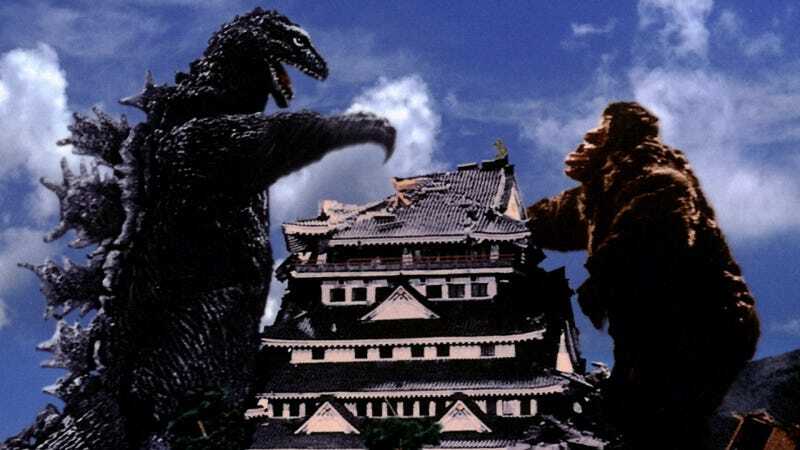 Fans surely know that King Kong and Godzilla have faced off before, in a 1962 Japanese film, as seen above. But they’ve never faced off in a big budget Hollywood film and that’s what’s going to happen here. It’s kind of a dream team. And possibly, the start of the Monster Avengers.